I loved going to the farmers market when we lived in Oregon. It was amazing, having everything from organic produce to homemade arts and crafts. It was outdoors and only in the summer. Coming to my first farmer's market in Alabama, I was in for more than a cultural shock. It wasn't just a lack of organics and fewer craft vendors...there was a language barrier! I thought since we all lived in the US we all spoke the same language. Ha! Those folks at the market claimed they were speaking English, but it wasn't any English I had heard before. And the produce...it wasn't what I had seen before either. When it came to leafy greens, my experience was limited to kale, spinach and assorted lettuces and certainly not mustard and turnip greens! Things came to a complete standstill for me when I stood before an old man selling beans. Now, I knew pinto, garbanzo, black beans, red beans. . . My eyes started to glaze over and I asked the man what type of beans he was selling: "Peeye pur ho" English? Please...I asked him to repeat himself so many times. It was embarrassing and he was frustrated with the "yankee" at least that's what I think he said to the woman he called over to speak with me. She translated for me: "Pink Eyed Purple Hulled Beans." Great...more foods I had no idea what to do with. And since I wasted her time so completely, I felt compelled to buy something...anything...except beans and greens which I had already discovered I lacked the basic southern cooking skills to prepare in any remotely edible fashion. "Do you have any tomatoes?" No, but the vendor at the end had some. And they were green. Green Tomatoes. I asked what I was supposed to do with green tomatoes...because where I came from, those are still supposed to be on the vine. "Fry 'em up in cornmeal," she instructed me. I stood there looking stupid and then further humiliated myself with this gem: "You mean like in the movie title?" Yup. Fried Green Tomatoes isn't just a classic movie, it's an actual food. And, it's actually pretty darn tasty. Since Iron Chef Mom this week is all about tomatoes, I figured I'd share one of my first successful ventures into southern cuisine...and put a comfort food spin on it...with a bit cheese. In a medium skillet, heat about 2 T of oil over medium heat. Dip sliced tomatoes in egg, then coat both sides in bread crumbs. Place tomato in hot oil and cook until golden (about 2 minutes), then turn over and cook the other side. Remove tomatoes from oil and drain on paper towel. Bring another skillet to a low heat, melting butter in the pan. Place a liberal amount of grated cheddar on a slice of bread, then a fried tomato, followed by more cheese. Top with the bread. Grill on both sides until golden and cheese is gooey melty. 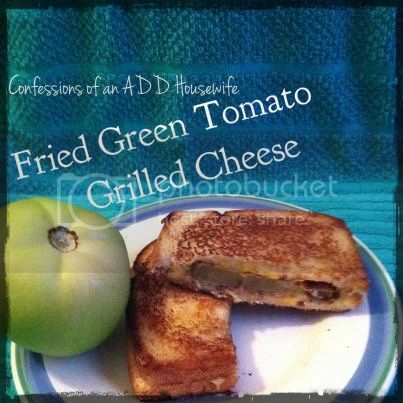 This looks delicious - although I've never had a fried green tomato. I'm even from the south originally. I'm not sure if I even have access to green tomatoes in Michigan where I live now! Sounds amazing! I only tried making fried green tomatoes once and it wasn't exactly successful. But that was a long long time ago and I've learned a lot about cooking since then. You've just reminded me about them and I'm going to try again soon...well, as soon as Ifind some green tomatoes, that is! Green tomatoes! My favourite. Gran always dredged them in a bit of seasoned flour and then fried them in lard. Let's face it-lard makes everything better. YUM! That sandwich looks delicious! As a born and raised Southerner this sounds FABULOUS! I would love it if you would come share it at my Funday Sunday link party that opens this Saturday at www.the-crafty-cowgirl.com. Hope to see you there! Sounds delicious. I order fried green tomatoes every chance I get and have done a BLFGT (Fried Green Tomato BLT), but never thought of grilled cheese. Perfect! Interesting. I like grill cheese and I like fried green tomatoes. I have seen them on a BLT like Lane said. 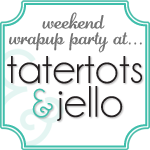 Thanks for sharing with us at Foodie Friends Friday link party. I have never eaten fried green tomatoes.. I wonder if they are the same tomatoes just not ripened. Thanks for sharing on Foodie Friends Friday and hope that you will come back next week. Newest follower on Linky. Oh my goodness, this grilled cheese looks great! You know what I also like? The fact that you come to Whimsy Wednesday each week. We LOVE your creations and inspirations! Sounds good to me! Yum! thanks for linking up!